Cherry blossoms are beginning to sprinkle the trees along busy streets in New York City, which means it’s time for spring wedding season in New York to begin! After months of cold, grey days, springtime in New York is unlike any other. From rooftop venues to lush gardens, New York is an ideal place to celebrate the new season and the next chapter of your life together. Today we are joined by expert wedding planner and designer Cristina Verger, whose New York weddings have wowed couples and guests for more than 25 years. If you’ve been dreaming of an NYC wedding in springtime, Cristina’s unparalleled wisdom is the best place to start. Why New York in springtime? New York City is always a special place every season, the energy of the city is intoxicating! With the Spring “new life” comes to the city and makes this season of fresh new starts a perfect time to start a new life as a couple. Cherry blossoms are in full bloom and places like Central Park and the Conservatory Gardens provide a fabulous backdrop for photos. The days are longer and sunsets are unique and perfect for early evening weddings, in one of the venues offering spectacular views. With so many new blooms, flower/decor can be magical and can be used to bring the joyous colors of spring indoors. New spring collections bring fresh new looks for both wedding gowns and bridesmaids dresses. Even food can be infused with the season’s produce that can wake up the palate and refresh the taste. In short, Spring is all about fresh and new, what better time for a wedding! New York city offers a wealth of venues for every taste and style. For the spring it is always preferable to have a place that has a feeling of open and light. Some of my favorite are: Bryant Park Grill, I love this place which is located right in Bryant Park abutting the NY Public library, in the heart of the city yet in its own oasis of green. The Mandarin Oriental, is always one of my favorites, the views are phenomenal and the ballroom is a blank slate in which you can create any design. The Museum of the City of New York is another one of my favorites for the spring, directly across the street from the Conservatory Gardens, it makes for a quintessential New York City wedding. I have always been a big fan of incorporating natural elements and in “marrying” the outside with the inside whenever possible, depending on the venue. In the spring the options for flowers are many, for weddings in March/April I LOVE cherry blossoms, both white and pink, as they create the most wonderful environments and truly bring a jolt of spring to any venue. For the latter part of May, peonies, a most romantic flower, are fabulous! Lots of green plants throughout and all natural fabrics such as 100% linen tablecloths and napkins. Depending on the look, vintage china is a great touch for a very unique design. Invitations set the tone. Here is a great opportunity to “personalize” right from the start. Type of paper, weight of paper, gorgeous and unique calligraphy, colors, wording. A fabulous invitation will not be put aside so quickly and will stand out from the rest. The invitation will be an introduction to what’s to come. Music is another way to personalize your day. Recently we had a male and female duet learn and sing “Con te partirò’” at a wedding. This was the bride’s father’s favorite song, and the duet received a standing ovation from the 200+ guests. Of course, the decor is where the couple’s personality can be expressed, whether sleek and clean, or more romantic, baroque and colorful. Have fun planning your wedding! Let the experts guide you into making this celebration one that will be forever treasured by you, your family, and friends. Spring is a beautiful time of the year (and my favorite)! Allow the season to participate in your festivities and you will have a fabulous start to your new life together. A big thanks to Cristina Verger for sharing your lovely insight on planning an NYC wedding in spring! 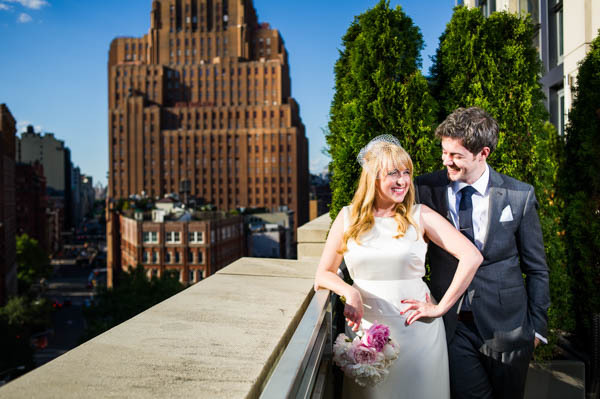 Interested in learning more about Cristina and her New York weddings? Check out her portfolio! Wow! Amazing photography…. Thanks for sharing with us.